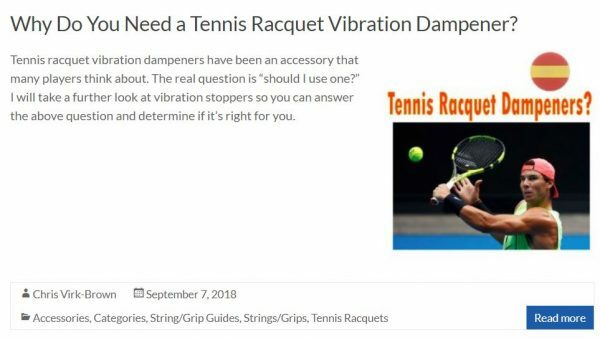 If you’ve ever played tennis in hot, muggy temperatures and lost your racquet due to a sweaty grip then you know how important an overgrip can be! Finding the best overgrip for yourself though isn’t always easy. There are so many options and you never know if any overgrip will feel great in your hands. Through many grip playtests and lots of hot temperatures, I have found 10 overgrips that are truly the best on the market for keeping your racquet handle in great condition. I will break down the 5 best tacky overgrips and 5 best absorbent overgrips so you can easily find one you like. This one surprised me quite a bit and is truly a phenomenal pick. I was not expecting the tackiness of this overgrip to be consistent for such a long time. Just like the label says it’s really “the tackiest grip ever made!” At first, the grip feels almost too tacky because your hand feels stuck to your racquet handle and doesn’t move. However, as it starts to get a little moisture the tackiness slightly goes down and lets your hand move more comfortably without fear of losing your grip. If you stop using your racquet for 1-2 minutes, the grip will dry quickly and feel just as tacky as before. Over time the grip will get dirty, but it doesn’t lose a lot of its tackiness. It took me about 25-30 hours of hitting before it started to feel uncomfortable and needed to be replaced. Players who want something that stays tacky and absorbs moisture fairly well should try this out. Tourna MegaTac comes in a 3 pack, 10 pack or 30 pack. This is true classic when it comes to the overgrip market. I personally have been using this since I first started playing tennis. No matter what grips are out there I’ve always found this overgrip to be one of the best. In addition, this is one of the most popular grips used on the pro circuit by ATP and WTA players. From the beginning this grip has a great amount of tackiness and stretches very well so it’s easier to put on your racquet handle. In cooler and less humid temperatures this is more ideal because it doesn’t lose tackiness as fast or feel really slippery. In 90+ degree temperatures this grip will start to feel slippery fairly quickly and require some wait time so it can dry. The great part about this overgrip is its durability. I could get about 15-20 hours of hitting in before it started to feel too dirty and lose most of its tackiness. 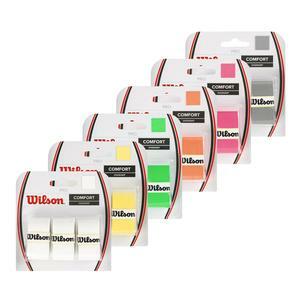 You can get the Wilson Pro Overgrip in a 3 Pack, 12 Pack, 30 Pack, 50 Pack or 60 Pack and in a variety of colors. Having never used a Yonex overgrip before, this one was shocking to say the least. This grip has been getting more and more popular as time has come along. I personally found this grip to have just the right amount of tackiness and stretchiness to fit my needs. 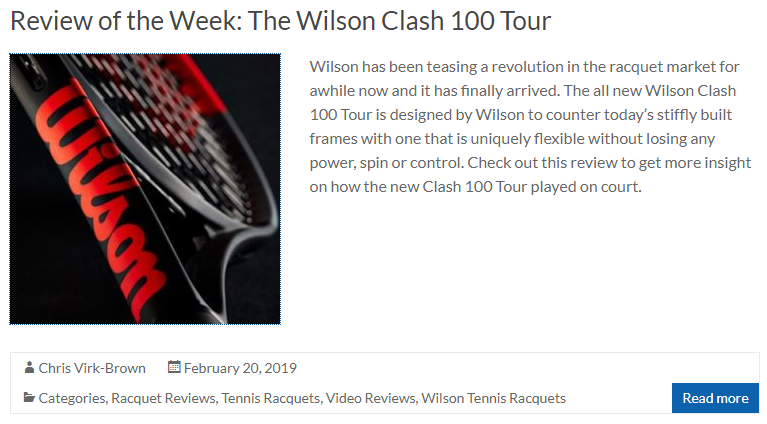 Players that normally like the Wilson Pro Overgrip will definitely enjoy this Yonex competitor. Both are similar in terms of feel and ease to put on your racquet handle. The only difference I found is that the Yonex overgrip does tend to get dirtier faster and it only lasted me about 10-15 hours on the court. However, this grip is ideal for players that want something tacky/elastic and don’t sweat much when they play. You can get the Yonex Super Grap in a 3 Pack, 12 Pack or 30 Pack. EcoGrip makes an astounding overgrip that is very unique to the tennis market. Although their Hi-Tac grip seems similar just from the look, it’s something completely different when you actually use it. The outside texture will feel more like an absorbent overgrip which is kind of rough on dry hands. In addition, this grip doesn’t stretch a lot in comparison to other tacky grips. However, when you start sweating the grip absorbs the moisture and turns that into a tacky feel helping your hand stay more secure. The perforated holes allow for the grip to quickly dry even as you continue sweating. In terms of durability I found this grip to last about 10-15 hours, but this is in 90+ degree weather. If you don’t play consistently in hot temperatures, the Hi-Tac grip should easily last 20-25 hours. The best part is that when you are finished you can throw it onto the earth’s soil to decompose. 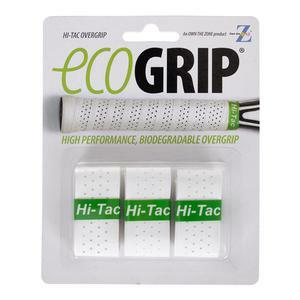 Any players that want to help save the environment, and need something that’s tacky as well as absorbent will enjoy the EcoGrip Hi-Tac overgrip. Available in a 3 Pack or 12 Pack. Gamma has been making overgrips for many years, but there are often many choices from this brand. The SupremeTM overgrip is the best by far and stands out compared to the rest. Players will find this grip to provide a good amount of tackiness and durability at a cheaper price point. Both ends of the overgrip are angled making it easier for beginners to put on their racquet handle and it has a little bit of stretch. In terms of performance I found it very tacky in the beginning and it provided a great amount of handle security. Over time however it seemed to absorb the sweat and sun too much making it difficult to hold my racquet more than 30 minutes at a time. The durability was better than expected lasting about 10-15 hours total, but I’d recommend players using this in mild or cooler temperatures for better performance. 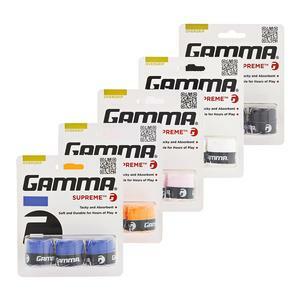 Gamma Supreme Overgrips come in a 3 Pack, 15 Pack or 30 Pack. Tourna Grip is a tried and true classic absorbent grip that many players always turn to. Whether you’re a pro tour or recreational player this overgrip is a go-to for those hot weather conditions. Unlike tacky grips, this grip will directly absorb your sweat and never let the handle feel slippery. It has a dry consistency enabling easier gripping as you play and sweat, but one drawback is that the grip sheds over time losing its top layers which is not always comfortable. This grip is also very elastic allowing for superior stretching ability and making it easy to wrap around your racquet handle. On the durability side, this grip will last anywhere from 20-30 hours depending on how much you sweat. The best part is that this overgrip comes in various sizes and packs fitting to different racquet handle lengths. Players can get the regular Tourna Grip in a 3 Pack, 10 Pack or 30 Pack. There’s also Tourna Grip XL which is a little longer and comes in a 3 Pack, 10 Pack, 30 Pack or 50 Pack. For players with extended racquets, there is the Tourna Grip XXL available in a 3 Pack, 10 Pack, or 30 Pack. This overgrip got its ticket to fame from Grand Slam Champion Rafael Nadal. Nadal uses these grips to provide him with excellent sweat absorption and keep his racquet handle dry. Similar to Tourna Grip, VS Original has a dry consistency allowing it to take in lots of sweat and not affect your racquet handle. This is the thinnest grip on the market with the smoothest outside layer to enhance the overall feel. The smooth outside layer makes it feel closer to a tacky grip, but the dry material underneath provides you with more absorption ability. In terms of durability you will get about 15-20 hours of hitting before it will need to be replaced. For those that aspire to play like Babolat’s greatest tennis players, then the VS Original is just what you need. 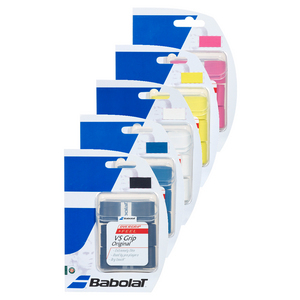 The Babolat VS Original overgrip comes in a 3 Pack or 12 Pack. Although it is relatively new to the market, the Luxilon Elite Dry grip is an awesome grip that most players don’t know about yet. It’s made with revolutionary Soft Touch fabric and Moisture-Tack technology to provide you with excellent feel, comfort and sweat absorption ability. The outside layer has a dry texture initially and as you play the grip gets a little tacky. It doesn’t have a long durability life (10-15 hours) since it sheds layers over time. But this is still a great option for players that need superior sweat absorption in hot weather. Players that trust Luxilon with their strings should also trust the brand with their overgrips. 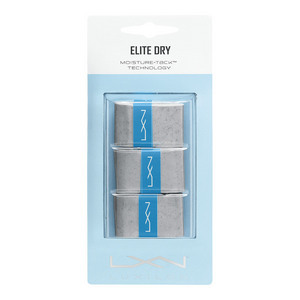 LXN Elite Dry grips come in a 3 Pack, 12 Pack or 30 Pack. Volkl’s V-Dry overgrips offer superior levels of absorbency and cushioning at a lower price point. This grip is made with dry texture properties allowing it to take in higher amounts of sweat from your hands. The main difference is that it has a tech finish on the outside layer to give it more protection from dirt and sweat. This finish is smooth to the touch and makes the grip more comfortable to use. After about 10-15 hours of play the top layer wears off and the grip becomes harder to use because it starts to feel spongy/wet. I’d recommend players using this grip during cooler/less humid conditions to make it longer lasting. 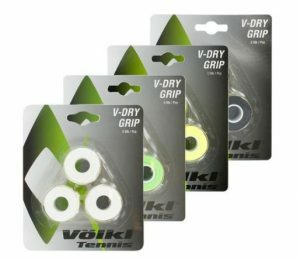 Volkl V-Dry tennis grips come in a 3 Pack, 12 Pack or 30 Pack and a variety of colors. We know Head to make great tennis racquets, but what about overgrips? Prime is Head’s most successful overgrip ever made and is the most used on tour by professionals. It’s made to give you better feel and sweat absorption ability thanks to its specifically engineered elastomer makeup. The grip doesn’t stretch a lot and is fairly thick so it will take some time to get used to. Initially Prime is very comfortable and doesn’t make your hands feel super dry. As you sweat more, the grip will become a little slick and less dry feeling. After about 10-12 hours of play I found the grip to get too dirty and slippery making me want to replace it. 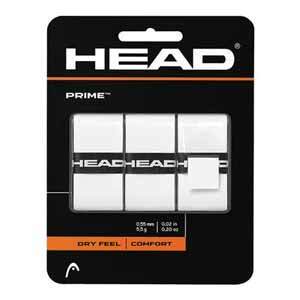 Head Prime overgrips are available in a 3 Pack or 30 Pack. Whether you prefer a tacky or absorbent overgrip, just know that there is one out there for you to use. The above grips will give you handle security and provide excellent gripping ability even during those hot/humid summer days. In addition, they are inexpensive to replace, protect your racquet handle from dirt/moisture and come in variety of colors. If you want to look and play like the professionals, purchase an overgrip today from TennisExpress.com.